As a 6th generation brewery, we understand the importance of educating the next group of passionate brewers. That’s why we’ve sponsored a tuition scholarship for the University of South Florida’s St. Petersburg Brewing Arts Program for a second semester. Launched in 2015, the USFSP program is designed for both hobbyists and enthusiasts looking to make a career in the industry. Our scholarship grants a student, who previously served in the military, the opportunity to learn foundational brewing knowledge via online courses and then complete hands-on training with a local brewery. We took moment to speak to this year’s scholarship awardee and military veteran, Henry Richard, and were so inspired we had to share his amazing story. Can you tell us a little about yourself? How did your passion for brewing begin? I attended Texas State University and graduated with a BA in History, before enlisting in the United States Army to be a medic. While serving at Fort Bragg in the Emergency Department at Womack Army Medical Center, I was exposed to craft beer through several coworkers who were avid homebrewers, and a couple who had opened a brewery. Following my honorable discharge in December 2016, I returned to Maine and began to experience the craft beer scene. Eventually, I purchased a homebrewing kit and began brewing regularly with my younger brother. I’m currently a single father to my 2-year-old daughter, Charlotte, and enrolled at the University of Southern Maine, where I study biology and work as a teaching assistant for the Microbiology for Health Sciences course. 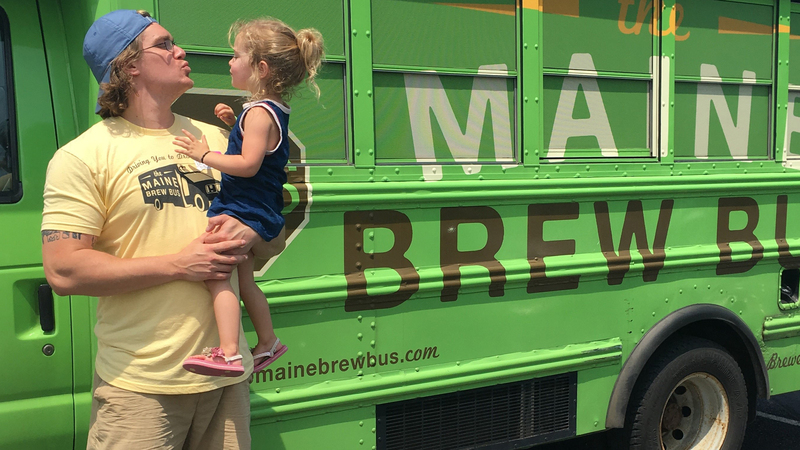 I also work for The Maine Brew Bus, which is an education-based beer/alcohol tourism company. What inspired you to apply for the scholarship? How will the scholarship help you? 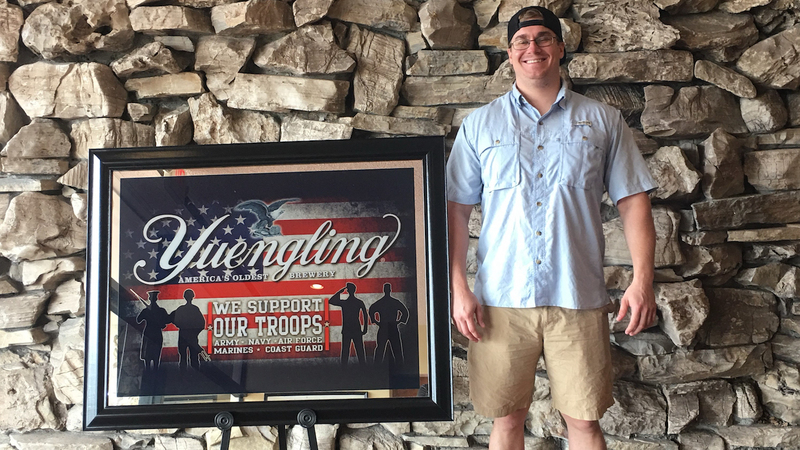 As I was researching brewing programs, I read about the scholarship awarded to one veteran from Yuengling. Having to raise my daughter as a single parent while enrolled at a university makes it difficult to work full time. Knowing I couldn’t pay out-of-pocket or take on more student debt, I applied for the scholarship. Without this veteran scholarship, I would’ve had to postpone enrolling, or get creative (I’m thankful I didn’t have to sell a kidney!). Yuengling is helping make my dreams a reality. What is your ultimate goal after completing the USFSP Brewing Arts Program? My ultimate goal is to open a small brewery in a couple years with my younger brother. We’d love to open a fun and welcoming space, serving great beer, and being involved in our local community. I hope to bring the fun and social aspects of craft beer to wherever we end up – hopefully Florida, Texas or California. What’s your favorite thing about making beer? What keeps you interested in brewing and the beer industry? My favorite part about making beer is that the process can be very social. While brewing, I get to bond with friends over something I’m super passionate about. Once the beer is finished, it’s all about hanging out with friends and having a good time. As someone who works closely with the craft beer industry, it’s this social aspect and the time spent with friends – old and new alike – that I find most enjoyable. I’m also a pretty big biology nerd, and the science of beer fascinates me. What are your favorite types of beer to drink or brew? My favorite style of beer is probably the American pale ale. As a tour guide for The Maine Brew Bus, I’ve been exposed to many beers outside my comfort zone, and I’ve begun to really expand my horizons. I tend to tell people that my favorite beer to drink is “the next one.” In regards to brewing, my favorite part is spending time with friends, so the style of beer doesn’t matter as much as who I’m brewing with. What most do you admire about Yuengling as a brewery? Yuengling epitomizes the American Dream. When David Yuengling founded the brewery in 1829, I’m sure he never imagined his hard work would withstand the test of time. Nearly 190 years later, Yuengling is America’s Oldest Brewery, America’s No.1 Craft Brewery, and is still pumping out incredible beers year after year. As someone who talks about the history of beer in America for a living, I spend a lot of time every week sharing Yuengling’s story with beer nerds and novices alike. What lessons/skills have you applied from your experience as a combat medic and father to your brewing practices? Conversely, what do you learn from brewing that you try to incorporate into your everyday life? Being a medic and being a father have taught me three lessons that I have applied to my brewing practices: patience is critical, everything does not always go as planned, and your attitude dictates your experience. Being a medic also increased my attention to detail, whereas my daughter inspires me to always have fun and make the most of all situations. Brewing has made me realize the amount of time and effort that go into seemingly insignificant items. A pint of beer at a tasting room or bar is a result of the hard work of dozens of people. Once I started to brew, I began to contemplate the hard work, diligence, and craft in items I encounter or consume on a regular basis. Brewing beer has made me appreciate the world around me significantly more.